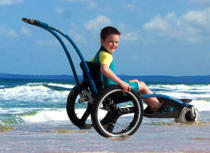 Designed for use on the beach and into the sea, for adults and children, this is the ideal choice for access to the sands. 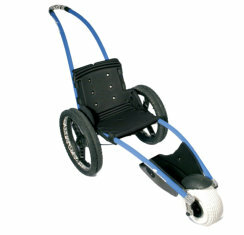 The basic model comes with a push handle, tow rope, adjustable height backrest, and a travel bag. 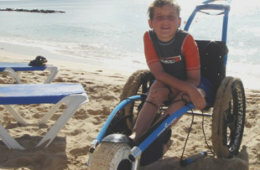 Optional extras include: Balloon wheels to spread the weight still further across the sand to allow access to soft dune beaches. Waist Belt Harness Armrests Headrest Snow Skis Available in Small, Medium, Large and XL the seat dimensions remain the same whilst the distance from the seat to the front wheel increases. Blue or Pink frames are available. 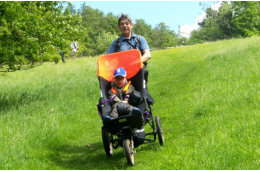 Designed and manufactured in the UK this lightweight robust 3 wheeler offers access to previously inaccessable places. Whether you enjoy the beach or country parks or long walks with the dog, the Delta is the perfect companion for you. Folding quickly and compactly and with dual rear brakes, a supportive canvas and an adjustable footplate family walks will soon become a pleasure. 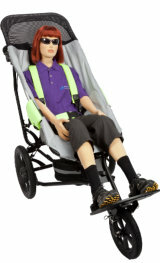 The standard Delta includes a lightweight alumimium frame, supportive canvas, 5 point harness, luggage bag under the seat, adjustable height push handle, a swivel anti tip device, quick release wheels, an adjustable folding footplate, footstraps and heel loops. 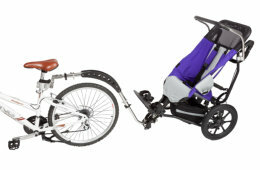 Optional extras include: Sun Canopy Rain Cover (Small and Medium) Beach Wheels (Quick release double tyres designed to spread the load) Wedge Cushion Pommel Travel bag Available in 5 sizes and various colour options to suit children from 6 months and adults up to 190cm or 90kg. Designed to convert the Small and Medium Delta into a bicycle trailer this Trail bar has been engineered to keep the Delta upright even if the bicycle falls over. 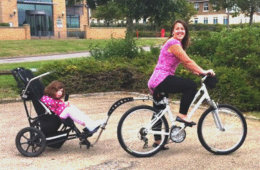 A simple mount to the saddle post allows mutiple cyclists to tow the buggy. An easy to fit Roll Bar completes the kit necessary to ride off into the sunset. The front wheel of the Delta stores in the under bag for use when you reach your destination.